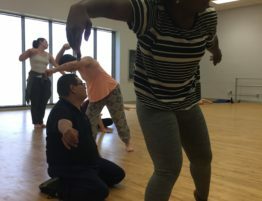 Rita Mathis, a student of mine and a Body Shift participant, wrote this essay regarding her work in mixed-ability dance. I just love how she writes and what she says. “Que sera, sera” is an expression that ought to garner more thought than it generally does. A person may gesture a nod of approval for the phrase “whatever will be, will be”, yet overlook important principles implied within this sentiment. While the expression has been fostered by our society, its fundamental ideals of acceptance still remain on the outskirts of social norms. 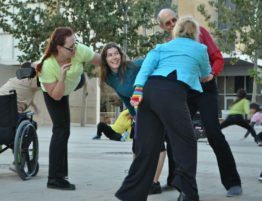 The value of embracing the way things are, is captured in the mixed-abilities dance movement right here in Austin. 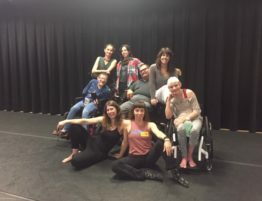 The mixed-abilities dance workshops bring together people of all ages and various abilities to share in the experience and the phenomenon of body movement. 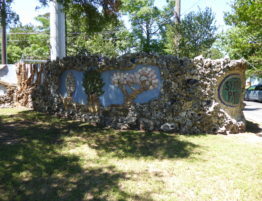 The workshops manifest acceptance by promoting awareness of valid limitations while removing perceived limitations and exemplifying the self as complete. Resigning oneself to realistic limitations is an important aspect during the mixed-abilities dance workshops. Often the instructor leading the group will remind everyone to do what makes sense to their body. It is important to be aware of what one’s body can and cannot achieve due not only to safety concerns, but as importantly for self-esteem. When a person is engaged in a group activity, they may feel pressured to perform up to the perceived standards of everyone else. 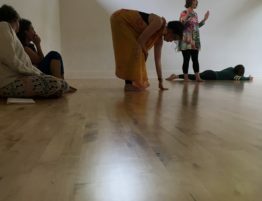 During the workshops, the compulsion to be like the rest of the group is not present and everyone is alert as to what actions they can perform in harmony with their body. 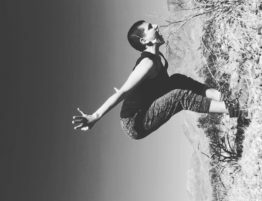 Participants find themselves entering a state of self-awareness, completely at ease with their own unique movements. All people can be thought of suffering from some type of disability; this can range from a person who has difficulty containing their anger to someone who may not be able to walk. Recognizing these limitations and openly sharing them with others, helps a person to wholly accept themselves, limits and all. 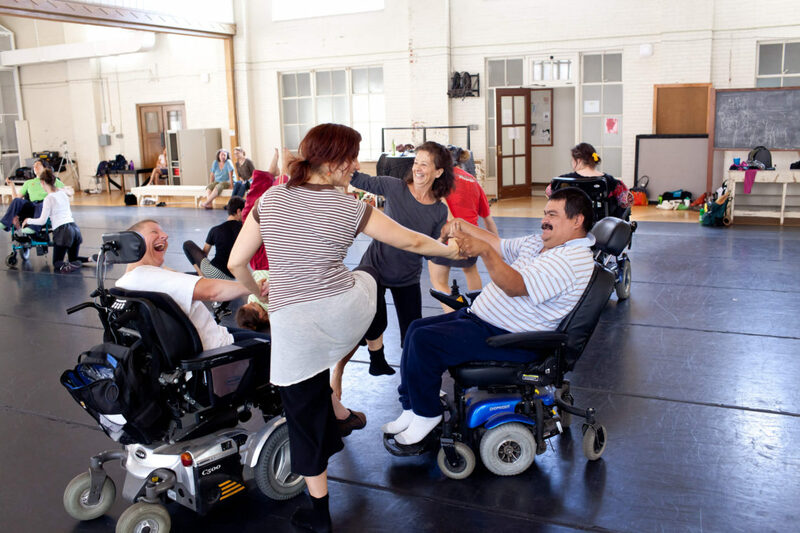 The mixed-abilities dance workshops also help remove other kinds of limitations that are imposed by social paradigms. Unfortunately, some people feel restricted in the activities in which they can participate. This can happen either because the activity may seem inappropriate considering ones abilities or because particular activities are considered only appropriate for certain body or personality types. Constrictions like these are often unintentional, but nonetheless keep the ideal of an inclusive society compartmentalized to mostly governmental programs. One way that the mixed-abilities dance workshops deal with the problem of imposed limitations is with semantics. The workshops accomplish the difficult task of taking an ancient form of expression, usually comprised of people with gymnast like bodies, and redefine the very nature of dance so that anyone may rightfully claim the title “dancer.” The workshops show that the most effective step in eliminating perceived limitations is to alter the ideas and practices of inhibitory constructs. The mixed abilities dance workshops serve to show people that they are complete by virtue of being themselves. Allison Orr, an Austin Community College dance instructor and a facilitator of the workshops, illuminated this point by saying that each person is “exactly how [they] are supposed to be.” The practice of bringing such an array of people together and highlighting their uniqueness helps set the stage of self-discovery. If a person can see the diversity of the world in a single room, then they can more easily find out that they are a complete element in this world. The dance workshops most vital lesson is that it is preferable that people are exactly the way are. In life, clearing every hurdle is impossible, but it is possible to alter our resolve to limitations as well as to create viable alternatives to others. These workshops take dance, which was once rigid in form, and expose it to a set of people who would perhaps never dance with others in absence of this opportunity. The mixed-abilities dance movement manifest “Que sera, sera” by encouraging the acceptance of the self and setting a supreme example for the way a community should be.